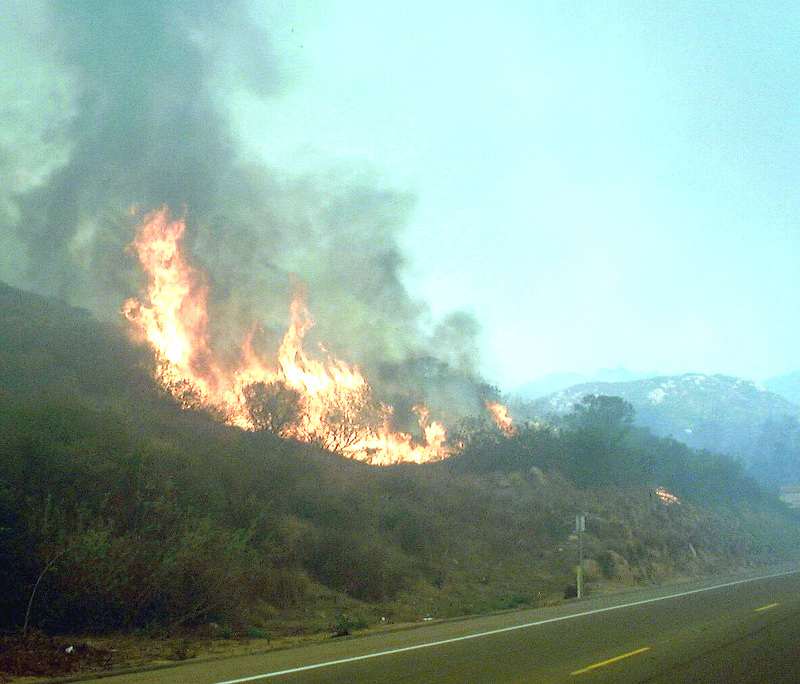 Ten years ago next month the Witch Creek Fire devastated Escondido, Rancho Santa Fe and North County San Diego. 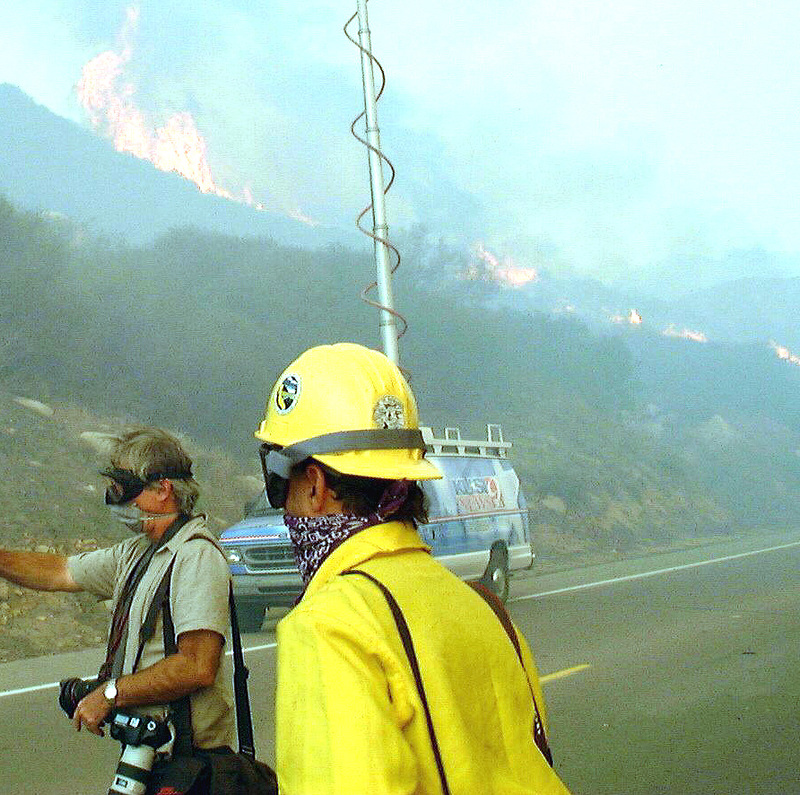 This is part of my first-hand coverage done as editor of the Rancho Santa Fe Record. I won the California Newspaper Publishers Association’s first place prize for local news coverage for this, and the other 26 stories, numerous photos, and overall coverage I produced during, and following, the fire in late October and early November, 2007. 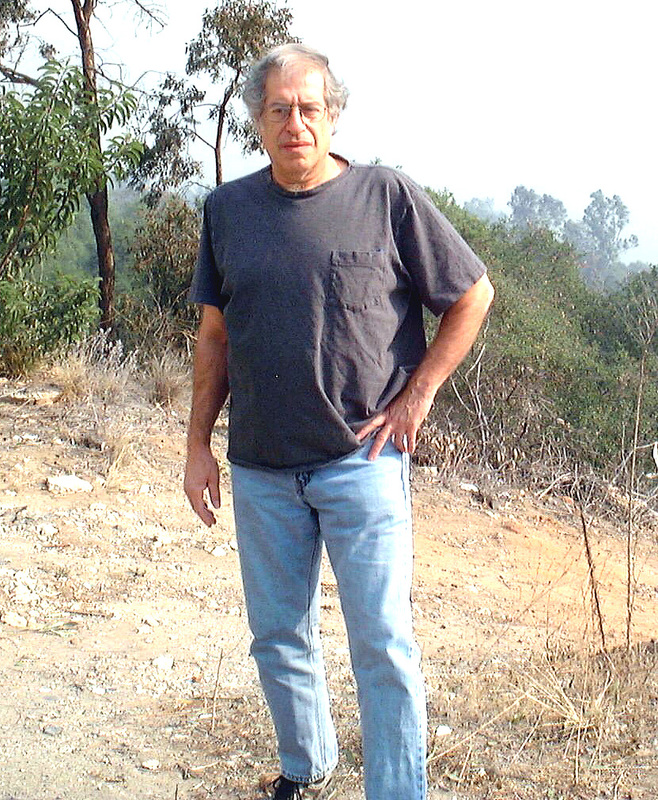 For nearly three hours, starting around 11 a.m. on Tuesday, Oct. 23, the fate of Harmony Grove, Elfin Forest, Del Dios, Rancho Santa Fe, Olivenhain and Solana Beach twisted in the wind and flames. Stan Smith, “Big” Kenny Morris, John Stewart, Steve Werner and Steve “the plumbing guy”, shirtless and fearless, ran from house to house below, shutting off propane connections and dodging bullets set off inside structures, saving their neighbors’ homes. Helicopters from San Diego Fire, Cal Fire and the San Diego Sheriff’s Department circled with reckless abandon, swiftly dipping into Lake Hodges or Olivenhain Reservoir, dropping bucket load after load of water on the Witch Creek fire gone mad. Less than a football field length’s above, along a highway drenched with ash and flames, punctuated by water droplets from the choppers, engine companies from Rancho Santa Fe, Carlsbad and Oceanside, supported by Cal Fire, Camp Pendleton, Salinas and sheriff’s units battled as if there were no tomorrow. And there wasn’t. This line had to hold. The fire that could not contain its wrath had just one more hill to climb before it would race down the valleys to the coast. Countless homes and lives hung in the balance. Color me crazy. Color me dumb. I’ve been in disasters before. Hell, my whole life has been one. Joking aside, I’ve covered massive, fog-driven highway chain collisions, including one of the largest in state history at Elk Grove. I was just outside Santana High School when Charles Andrew Williams went berserk and shot up his classmates. Walked through downtown San Salvador when the war zone there resembled the movie, “Escape from New York.” At Conway, Ark., I survived a tornado that lifted the roof off my friend’s garage as we huddled under the kitchen table for dear life. And now this. I “mandatorily” evacuated briefly from my Del Dios shack of a home long enough to put out last week’s newspaper. But I had to return. Along a deserted Paseo Delicias on the way home, two cars drifted by and stopped. Todd Milbourn drove one. Randy Perch drove the other. As it turned out, Milbourn was a reported and Perch a photographer for the Sacramento Bee, my old newspaper. We exchanged notes and moved on down the line. 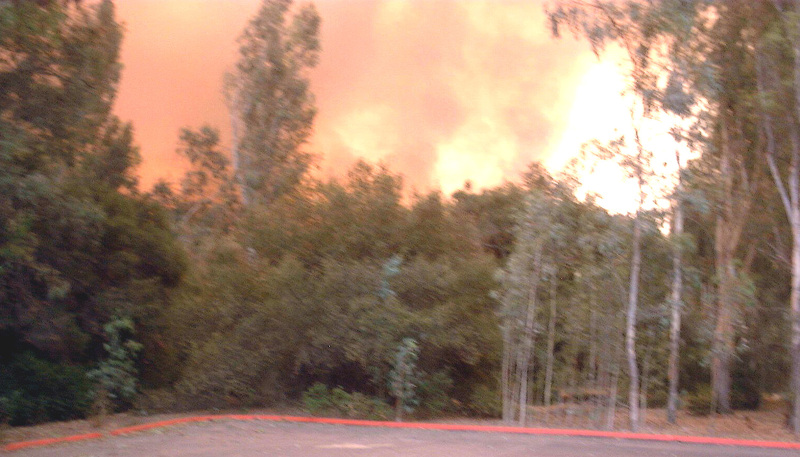 While Rancho Bernardo, just across Lake Hodges to the east, was under siege, we didn’t know the extent of the danger. 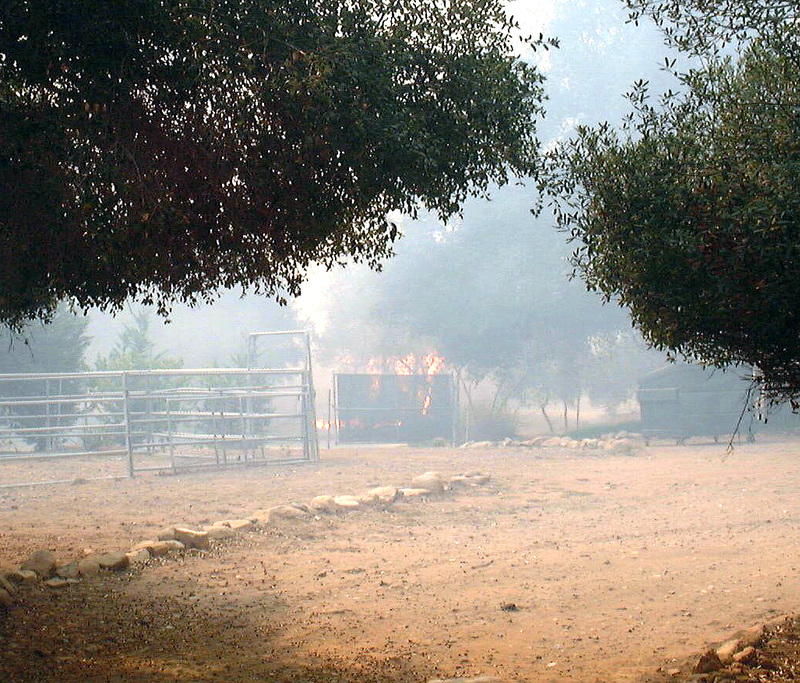 So, as flames flew across Del Dios Ranch at El Camino del Norte, and firefighters let them burn out naturally, we had no clue what would happen next. Aside from emergency personnel. The media was allowed full access though the now-road blocked area from Del Mar to Escondido. This was not due to the largess of public officials. It’s state law. We were therefore the privileged few who could move between the embers. I’ve often said Del Dios Highway would be one of the most beautiful drives in the world if it weren’t for the traffic. That was not a problem these smoky days. Mine was the only vehicle on the road, generally. What’s more, my house had water and electricity that first Monday day and night of the Witch Creek Fire. I was concerned, but not overly so. I watched television pictures of the fire just south of Crosby Estate. Forecasters said the wind would blow it away from my home. But I also noted with great interest the thick smoke and wooden structures all around me. I slept cautiously that night, fully clothed, shoes on my feet, ready to dash for safety at any moment. The next morning, however, the winds shifted my way. Still clueless, somehow artist Larissa Gorikh rang me up at home. Turned out she had dreamt of me the night before, with flames flying across the tires of my SUV. We chatted briefly. I hung up the phone. Within moments, thick smoke filled my living room. I opened the door. The Witch Creek Fire had arrived at my steps. Being crazy, dumb and a journalist to boot, I jumped in my vehicle and raced toward the fire, going into the park by the lake and spying the apocalypse now. The fire was all consuming. Reversing gears quite frantically, I ran away faster than Arthur in “Monty Python and the Holy Grail,” up the hill. There I found North County’s firefighting last stand army on the hill fanning out to battle the fires that raged everywhere. They battled hard. They battled smart. 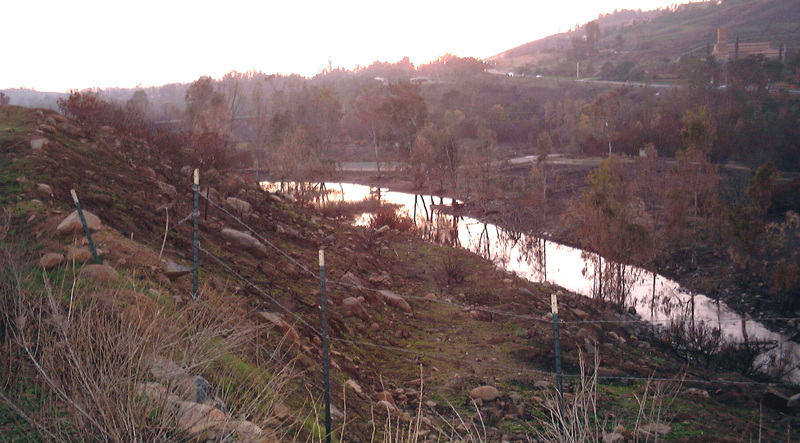 Crews set backfires and heaped water up the burring hills. After about an hour of this, during what seemed like a break in the fire, Randy, the Bee photographer, said this was a good time to check the status of my humble abode. We drove down the highway under what passed for blue sky. Which passed just as fast, for then we were shrouded by darkness at noon, embers and fire whipping just over our heads seemingly without a care on its way to Olivenhain Dam. Too late to turn back, we were on Elm Lane near the old fire station by my house. At this point, the house across the street burst into flames. It was fully involved in seemingly a split second. Fire danced at our feet. Rancho Santa Fe, Oceanside and Carlsbad units dove into the fight now. But it was too late for about two dozen houses. They managed to save the houses just north along Olive Street. Better leave, Randy said, and we got out fast, better alive than dead. The firefight lasted through around 2:30 p.m. It ended at Del Dios Highlands County Preserve, a habitat and recreational refuge opened with great fanfare just the week before, following 10 years of land acquisition and planning. This was our Gettysburg. And the last line of defense had held. My neighbors all were dearly departed. Emergency crews, firefighters, media and me were the only ones in town. Flames continued burring along the ground throughout the community that night. The next day engine companies from the San Francisco Fire Department rolled into town. Now I know how they must have felt in Paris during the Liberation. A former resident of The City, I shouted out my old home base, Capp Street, Capp Street to them and they gave me the thumbs-up. I drove around the area for days, usually the only civilian vehicle on the road. I went through 40 checkpoints. Sheriff’s deputies manned them sometimes. They went unattended during the height of the fire. Later, National Guard units from Ontario – some back from Iraq – moved in with heavy weapons chambered. Later, I thought it wise to check on friends from the Free Press at Valley Center. Not a great move, the fire danger had moved from here to there. Heading that way, I drove through the Fallbrook, Rice, Palomar Mountain and Valley Center fires. Palomar Mountain, in particular, with flames spiting into the sky, resembled those pictures of the sun with its solar flares. 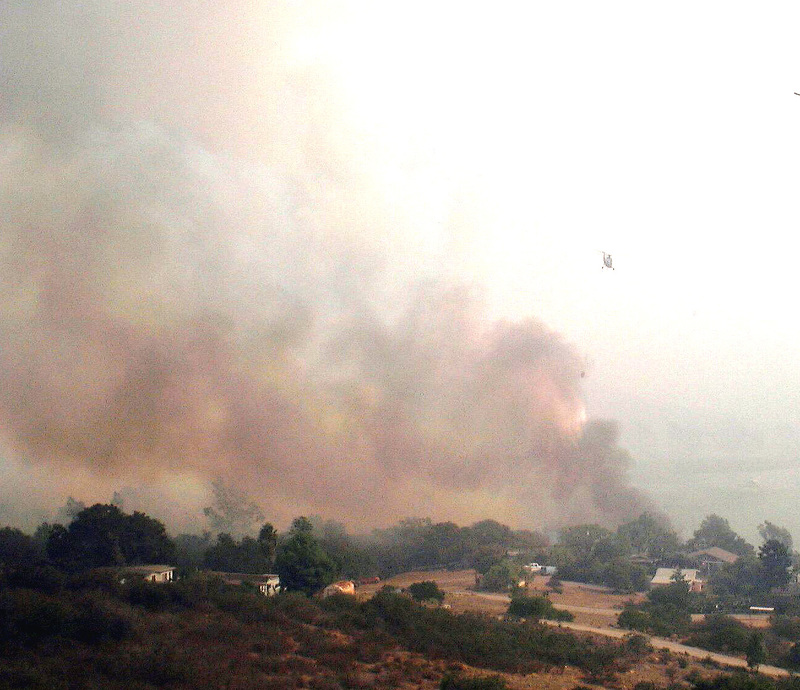 Returning to Del Dios, I saw how every house below mine had burned to the ground. Apparently, my landlord’s disdain for landscaping, as well as a fortuitous shifting of wind, had saved my humble home. Just as my old New Orleans house had managed to survive Katrina’s wrath intact, so, too, had my Del Dios home persevered. Color me crazy. Color me dumb. But color me alive. And grateful for help from above and the firefighters below who turned back the Witch Creek Fire at Del Dios and the highway that bears its name. 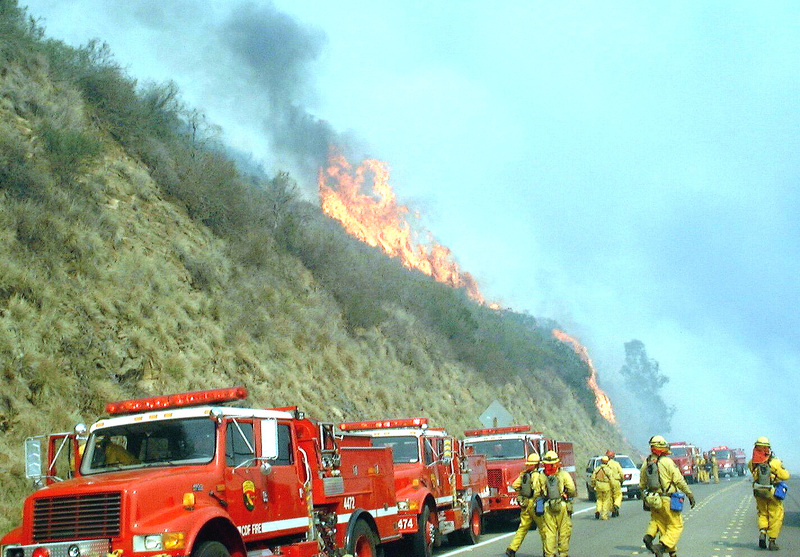 Be the first to comment on "Remembering the 2007 Witch Creek Fire"